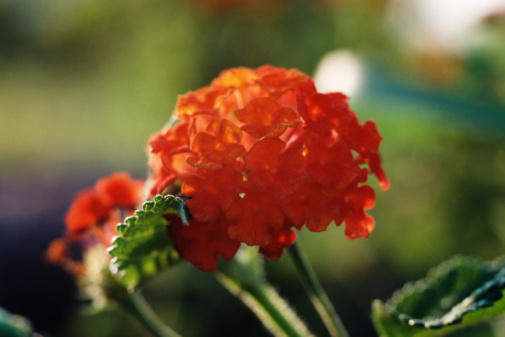 Lantana is a hardy evergreen shrub with a tropical origin. A good choice in a butterfly garden, lantana produces a profusion of bloom and is non-invasive. In mild climates lantana will bloom all year long. In cold climates it dies back to the ground after a hard frost. One way to produce a supply of fresh plants for spring bedding out is to take cuttings. Using cuttings is a vegetative propagation method that will give you several plants with the same characteristics as your parent plant. Lantana cuttings root easily and with a little care you can produce several more beautiful plants for your garden. Make sure your chosen pots or flats are sterile by using a 10% bleach solution. Rinse thoroughly and let the containers dry. Put a ½ to 1-inch layer of vermiculite in your pots or flats for drainage. Test containers for drainage by filling one with your germinating mix. Thoroughly wet the soil in the pot. If water does not drip steadily out add vermiculite to your potting mix. Use 1 part vermiculite to 1 part germinating mix. Fill your containers to just under the lip with your germinating mix. Thoroughly wet the soil in all the containers. Take softwood cuttings in the late spring or early summer from the ends of new growth. Use healthy, vigorous plants for cuttings and avoid wilted or obviously insect infested lantana. Take cuttings just before you plan to use them. Cut off a 4- to 5-inch section of the soft plant tip using a 45 degree cut. Make your cut 1 inch below the spot where a leaf joins the stem. Remove all but the top two leaves from the lantana cuttings. Strip off any flower buds on the end or sides of the cuttings. Roll the bottoms of the lantana cuttings in wet paper towels and put them in your carrier. Using moist toweling will prevent the ends of the cuttings from drying out if you are taking several cuttings at once. Make 3 inch deep holes in the soil mix in your containers just larger around than your cuttings and 2 inches apart. Using large pots will enable you to put several cuttings into one pot. For flats, make offset rows of cuttings. Unroll the lantana cuttings from the moist toweling and dip the ends in rooting hormone. Put your lantana cuttings in the holes in your potting soil. Firm in the cuttings by pressing the potting soil around them. Put stakes in the corners of your containers to support a cover of clear plastic film and prevent it from collapsing on your cuttings. Cover the pots or flats with plastic film. Make sure the film does not touch the cuttings. Cut one or two 1 inch slits in the top of the plastic to allow excess moisture to escape and to prevent overheating. Open the plastic completely once a day to prevent fungus. Put the lantana variety name, height and bloom color on a label on each pot to help in planning next spring's planting. Put the containers in a warm location (between 70 to 75 degrees is ideal) with filtered sunlight. Direct sun will cause wilting. Water the lantana cuttings regularly to keep the soil moist but avoid over-watering. If droplets form inside the plastic covering open it to ventilate the cuttings. Watch for new leaf growth or test the lantana cuttings at 6 weeks and again at 8 weeks. Tug gently and if the cuttings resist remove one carefully from the container to check for roots. Well formed roots means your lantana cuttings are ready for their own pots. Re-pot each cutting separately using the same type of soil mix. Mist the cuttings and water them. Discard the plastic film covering. Beth Asher began writing in 1972 for a catalog company. She has written for schools and charities, including Star Workshop Foundation. She was a John Deere representative for nine years, manager of Brown's Blueberries and an advisory member of King County Small Farms Board and the Washington Association of Landscape Professionals. Asher holds a Bachelor of Science in computer networking from City University.